We interact with water every day. It’s in our cells, we consume it, wash with it and even play in it. For us – for life in general – there’s no denying its importance. But what metaphysical properties does it possess and what role can it play in our spiritual lives? Research conducted by Dr. Masaru Emoto of Yokohama Municipal University in Japan is shedding light on some surprising properties of water. 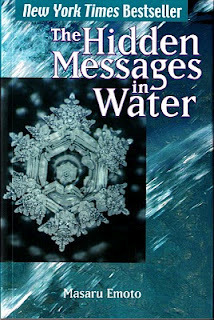 Dr. Emoto photographs samples of water as they freeze into ice for his book, Hidden Messages in Water. His samples, all from the same source, will form very different crystals depending on the words that are said during the process. Samples that freeze while negative words are spoken form discolored and truncated crystals, or sometimes fail to crystalize altogether. On the other hand, those samples frozen during the recitation of positive or encouraging words make clear, intricate, symmetrical and sprawling formations. The words can be said in any language to produce these results, so it would seem the behavior of the crystals is a function of the speaker’s intentions and not any particular combinations of sounds. It may be possible that to some extent, water can contain information the way semiconductors like silicon are combined to make a functioning computer chip, though at this point it would seem that the slow process of freezing and the nature of the information as a record of emotion lacks application. But who knows what the future will hold for this sort of experimentation? We do know at least that water is affected by our emotions, and this can be profound when you consider that up to 60% of the human body is water; 70% of our brains, almost 90% of our lungs, and 83% of our blood are water according to the US Geological Survey. Since this compound is influenced by our emotional intent, it is no wonder that we often feel physically better when we have happier thoughts or interact in a positive way with each other. This also lends credence to the notions of holy water and baptism. For many of our ordained ministers, they wanted to become a pastor to baptize others. This of course has a metaphorical aspect of cleansing a person, but it may also have some metaphysical aspect as the person baptized is washed with water that is enhanced by his attitude of submission and the intent of the ordained minister. The Universal Life Church Monastery gives you the tools to become a pastor and baptize followers. Whatever your beliefs are, water is a vital part of our lives. Given the research by Dr. Emoto and facts about our biology, the old adage “sticks and stones may break my bones, but words will never hurt me” seems to fall flat, especially when you consider that even our bones are themselves 22% water! Hallelujah. Thank you for this post. When blessing a home or a person, I always use holy water that I have blessed, along with prayer. I feel blessed to have come across your website and yes I became ordained and ordered products, I feel this is what I was guided to do become a minister and spread love and understanding. How can I make holy water? I will order all books to gain more knowledge. Thank you.